In fact, it's not your traditional fare at all. The typical tropes don't even exist here. Remember that film playing off the whole Twilight rage, only about zombies, the film called Warm Bodies? iZombie plays off of this pretty well, but heavily on yet another genre. Instead of romance, per se, we're talking about a criminal procedural complete with some really far-fetched paranormal science. Clever. Maybe a bit weird (definitely CW), but certainly catchy and intriguing. Girl becomes a zombie, zombie assists the police in finding bad guys. How? By eating the victims' brains. Wow.... That's way out there in left field. But it's interesting! In a perverse sort of...way. The premise makes for a ripe serialized show with endless possibilities, refreshing the police procedural drama in countless droves, but you also have to suspend disbelief here. We don't know many policemen willing to let a flesh-eating, brain-eating zombie work with them on criminal cases, especially when said zombie practically tampers with evidence and makes it hard for the coroner's office to do his/her job (....Where's the brain?). You can imagine if they plugged NCIS into this, Ducky would have a conniption fit. Still, this honestly revitalizes the one tired repetition phase many zombie stories end up falling into: oh, no, there are zombies, oh, no, we need to run, oh, yes, let's kill them all, oh, no, there are more zombies, oh, no, I just got bit, oh, no, I'm turning into a zombie, oh, no, you have to kill me -- rinse, repeat, rinse repeat. It's a fairly linear structure, and sometimes it's hard to investigate something new with it. 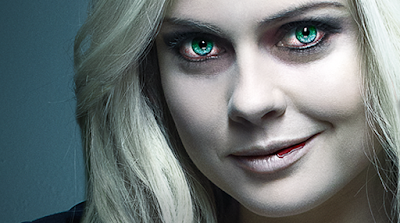 iZombie, however, takes the whole zombie thing into a completely new level. Whether That's a Good Thing for the Zombie Sub-Genre or Not? That's up to the viewer. We have our purists. The ones who are all for the all-out gore, the chase, the dismal dystopia of a carnal country looking for brains and flesh. The end of humanity. Still, the idea of a zombie...with at least some humanity left (like in Warm Bodies). Perhaps the thematic concept is a much deeper rabbit hole than we thought, and perhaps that may be a good thing?